The issue of doping has been the most widely discussed problem in sports ethics and is one of the most prominent issues across sports studies, the sports sciences and their constituent disciplines. 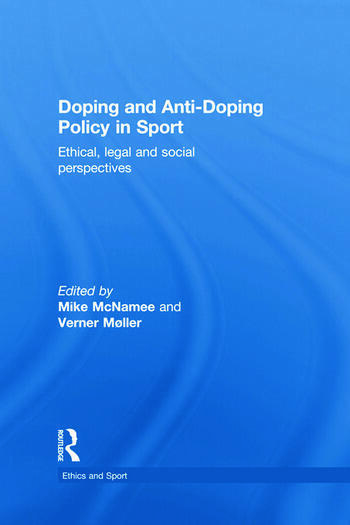 This book adds uniquely to that catalogue of discourses by focusing on extant anti-doping policy and doping practices from a range of multi-disciplinary perspectives (specifically ethical, legal, and social scientific). steroid use in the general population. Doping and Anti-Doping Policy in Sport offers an important critique of contemporary anti-doping policy and is essential reading for any advanced student, researcher or policy maker with an interest in this vital issue. 3 David McArdle: Longitudinal profiling, sports arbitration and the woman who had nothing to lose. Some Thoughts on Pechstein versus the International Skating Union. 12 Verner Møller: The expulsion of Michael Rasmussen from the Tour de France 2007 – Or what happened to the level playing field? Mike McNamee is Professor of Applied Ethics in the Department of Philosophy, History and Law in Healthcare, Swansea University, and is also a member of the Clinical Ethics Committee at Cardiff and Vale National Health Service Trust, UK. He is Series Editor of Ethics and Sport and Editor of the journal Sport, Ethics and Philosophy. He is a former President of the International Association for the Philosophy of Sport and the Founding Chair of the British Philosophy of Sport Association. Verner Møller is Professor of Sports Science at Aarhus University, Denmark. He is the coordinator of the International Network of Humanistic Doping Research (INHDR) and a leading expert on the cultural and philosophical aspects of doping.